Created by and starring Issa Rae, this comedy series looks at the friendship of two modern-day black women, as well as all of their uncomfortable experiences and racy tribulations. As they navigate the tricky professional and personal terrain of Los Angeles, best friends Issa (Rae) and Molly (Yvonne Orji) face the challenges of being black women who defy all stereotypes. 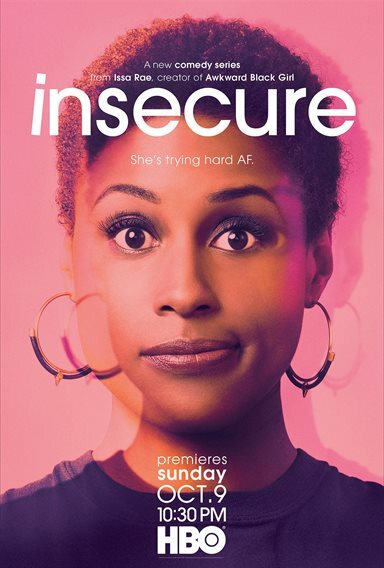 Download Insecure in Digital HD from the iTunes store. Insecure images are © 3 Arts Entertainment. All Rights Reserved. HBO was one of the forerunners in cable television to start their own programming. With shows like Game of Thrones, Westword, The Sopranos, VEEP, Silicon Valley, and True Blood, HBO has shown foresight into what captivates viewers and they have also shown that they are not afraid to spend money on their productions, which make the shows incredible to watch. While Insecure is not as powerful as some of the prior HBO series, nonetheless, it serves a purpose for millennials, as does Silicon Valley. Like Silicon Valley, Insecure explores the bonds between friends in the typical coming of age storyline. In contrast to the other millennial shows, Insecure shows the insecurities of women in relationships with men, with other women friends, and in their careers. 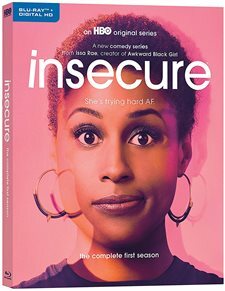 In fact, Insecure is aptly named because it is a real life series highlighting the obvious insecurities that this present generation must deal with on a daily basis and how hard life can be for the African-American women faced with decisions that are all consuming to this generation. Issa Rae plays Issa, the main character. She is a 29 year old liaison for an organization called "We Got Y'all" and she not only has boyfriend issues, but best friend issues, and career issues as well. As she approaches that magical number "30" she thinks she only has a year to get her life together before it all comes crumbling around her. However, it seems as if whatever she does just makes it worse. Issa ends up in awkward situations that are comedic and entertaining on one level, but almost sad on another level. It's as if life is so slippery that it just slips right out of her grasp as she's about to grab onto it. Rae brings a sense of realism to her character, which is refreshing because it's easy to be absorbed into her actions as if she is really your friend. In addition, I love the scenes where Issa talks to herself- and in front of the mirror! Come on girls- we've all done it- because the only way we will get the right answers is to answer our own questions and give ourselves the right advice! Rae not only stars in the series but created it alongside with Larry Wilmore. Rae is multitalented, as she also wrote the 2015 bestseller, The Misadventures of Awkward Black Girl, off which the television show is based. While many actors overextend themselves when taking on multiple roles within one project, Rae seems to handle her creation and acting in a well-balanced way. There is no lacking in her acting talent either which helps make this show successful. Lawrence (Jay Ellis, The Game) is Rae's live-in boyfriend who seems to represent everything that can go wrong. His girlfriend is on the search for something other than him; he can't seem to find a job after his dream start-up failed; and he seems to have no direction. It's almost as if he's with Issa because it's comfortable and there is nothing else to do. Oh, wait- that would be why Issa is with Lawrence. It's interesting to watch their relationship because it's not full of flowers and candy and brings up many issues that are contained within real relationships. Molly (Yvonne Orji; Comic View) is Rae's best friend and faces many of the same issues. Although Molly is a high powered, organized lawyer - in direct contrast to Rae's non-profit job - her love life is less powerful and disorganized compared to Rae's, which really, doesn't say much! The Blu-ray is presented in Codec MPEG-4 AVC with a resolution of 1080p and aspect ratio of 1.78:1. The colors don't pop as much as compared to a feature film or even other HBO shows such as VEEP and Silicon Valley, but that may be intentional. After all, this is a show about African-American women dealing with issues and problems that seem to get in the way of life. Regardless, the picture quality, for the most part is clear. Audio is English DTS-HD Master Audio 5.1. As Insecure is a mostly dialogue based show, there isn't much to get in the way of the clarity of the characters verbal interactions. Rae's voice is clearly heard in her diatribes. In clubs and bars when there is obvious background noise, dialogue is still clear. HBO does a nice job of presenting bonus features to its audiences. Overall, exploring the relationship of two women in a late coming of age comedy is presented in a real atmosphere. There is one huge criticism and that is the overt language used throughout the series as if it is completely normal to use obscenities in everyday sentences. Issa and Molly seem to both be too educated to really use that amount of obscenities on a daily basis, especially in professional surroundings. Insecure Season One is smart and relevant and entertaining enough, especially if you fall into that millennial demographic to which the show is aimed.